It’ll be a little easier to ride the bus and train starting today now that RTD has launched mobile ticketing — electronic fares that you can buy and validate with a smartphone or tablet. Transit riders who use the Android and Apple operating systems can download the app from Google Play and the App Store, respectively. 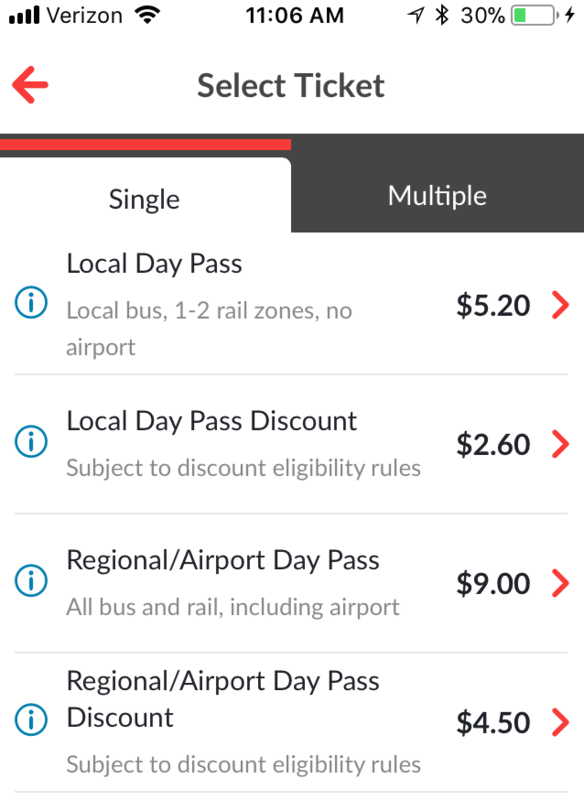 For now riders can only buy day passes, which cost the same as a two-way fare. That means unlimited rides for $5.20 a day on local routes and $9 on regional routes (half that for discount fares). As has always been the case with RTD day passes, they don’t last 24 hours; they expire just before 3 a.m. the day after purchase. RTD will roll out the fare technology in phases, as Streetsblog reported in April. Single ride fares will likely be the next option available, followed by monthly passes, but RTD does not have a timeline on those features. The agency wanted to get the fare tech up and running sooner than later, and other fare passes would’ve delayed the launch, RTD spokesperson Nate Currey said. Still, this development is a big deal for a transit system that’s behind cities in North America and overseas when it comes to easy, intuitive fare tech. Buying a bus fare on the fly used to require either exact change or a MyRide card, which is convenient when planning ahead, but can take up to three days to load money onto over the internet. And off-board fare payment is not only convenient for individuals, it’s good for the RTD system. Mobile fare tech can reduce “dwell time” — the amount of time a bus waits at a stop — by half or more, according to a report from the National Association of City Transportation Officials. With fewer riders searching for change and un-crumpling dollar bills, buses will get people to their destinations faster. Once you download the app, you can buy a ticket (or up to 10) with a credit or debit card. (Either create an account or check out as a guest.) Then activate the ticket any time before boarding. Bus drivers will inspect e-tickets, which consist of an animated QR code. Fare checkers on trains will scan the code to validate your fare. RTD integrated its trip planning functions into the app, helping riders map trips and providing access to real-time arrival information, schedules, and maps. How is the new tech working for you? Get at us on Twitter and Facebook to share your experience. What tech do the beepy machines use? Manual inspection is going to slow things down. Pathetic RTD, you are an antiquated beast who will always be behind the times.